M. A. Savelonas, Andreadis, A., Papaioannou, G., and Mavridis, P., “Exploiting Unbroken Surface Congruity for the Acceleration of Fragment Reassembly”, EUROGRAPHICS Workshop on Graphics and Cultural Heritage. 2017. Virtual reassembly problems are often encountered in the cultural heritage domain. The reassembly or "puzzling" problem is typically described as the process for the identification of corresponding pieces within a part collection, followed by the clustering and pose estimation of multiple parts that result in a virtual representation of assembled objects. This work addresses this problem with an efficient, user-guided computational approach. The proposed approach augments the typical reassembly pipeline with a smart culling step, where geometrically incompatible fragment combinations can be quickly rejected. After splitting each fragment into potentially fractured and intact facets, each intact facet is examined for prominent linear or curved structures and a heuristic test is employed to evaluate the plausibility of facet pairs, by comparing the number of feature curves associated with each facet, as well as the geometric texture of associated intact surfaces. This test excludes many pairwise combinations from the remaining part of the reassembly process, significantly reducing overall time cost. For all facet pairs that pass the initial plausibility test, pairwise registration driven by enhanced simulated annealing is applied, followed by multipart registration. The proposed reassembly approach is evaluated on real scanned data and our experiments demonstrate an increase in efficiency that ranges from 30% to more than 500% in some cases, depending on the number of culled combinations. 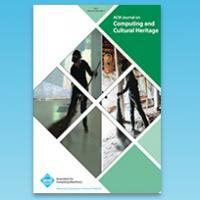 I. Pratikakis, Savelonas, M., Mavridis, P., Papaioannou, G., Sfikas, K., Arnaoutoglou, F., and Rieke-Zapp, D., “Predictive Digitisation of Cultural Heritage Objects”, Multimedia Tools and Applications, pp. 1-31 , 2017. 3D digitisation has been instrumental in the cultural heritage domain for over a decade, contributing to the digital preservation and dissemination of cultural heritage. Still, the typical 3D acquisition workflow remains complex and time-consuming. This work presents the concept of predictive digitisation by means of a platform, aiming to speed-up and simplify 3D digitisation, exploiting similarities in digital repositories of Cultural Heritage objects. G. Papaioannou, Schreck, T., Andreadis, A., Mavridis, P., Gregor, R., Sipiran, I., and Vardis, K., “From Reassembly to Object Completion: A Complete Systems Pipeline”, ACM Journal on Computing and Cultural Heritage (JOCCH), vol. 10, no. 2, 2017. The problem of restoration of broken artefacts, where large parts could be missing, is of high importance in archaeology. The typical manual restoration can become a tedious and error-prone process, which also does not scale well. In recent years, many methods have been proposed for assisting the process, most of which target specialized object types or operate under very strict constraints. 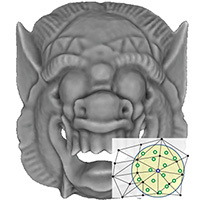 We propose a digital shape restoration pipeline consisting of proven, robust methods for automatic fragment reassembly and shape completion of generic three-dimensional objects of arbitrary type. 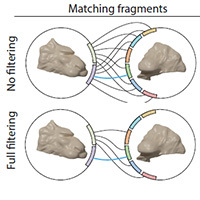 In this pipeline, first we introduce a novel unified approach for handling the reassembly of objects from heavily damaged fragments by exploiting both fracture surfaces and salient features on the intact sides of fragments, when available. Second, we propose an object completion procedure based on generalized symmetries and a complementary part extraction process that is suitable for driving the fabrication of missing geometry. We demonstrate the effectiveness of our approach using real-world fractured objects and software implemented as part of the EU-funded PRESIOUS project, which is also available for download from the project site. P. Perakis, Schellewald, C., Gebremariam, K. F., and Theoharis, T., “Simulating Erosion on Cultural Heritage Monuments”, 20th International Conference on Cultural Heritage and New Technologies (CHNT20). 2015. The erosion process is a multi-parametric phenomenon which is hard to simulate algorithmically due to the large number of parameters involved as well as the lack of erosion benchmarking data. Erosion data acquisition is particularly challenging due to the large time-frame involved. Our approach toward building an erosion model for specic types of stone and specic environmental parameters is described as well as the acquisition of erosion data from specialized accelerated erosion chambers. The stone types addressed are marble and soapstone. We obtain data from the erosion chambers which simulate atmospheric pollutants, the effect of salt intrusion as well as the freeze-thaw effect. Once a cultural heritage monument is scanned in 3D, the erosion simulator can be used to perform sensitivity analysis on the effect of erosion based on the variation of the input parameter values. This analysis can show the degree of danger that the cultural heritage monument is in, according to the assumed parametric values. Erosion values are mapped onto the 3D scan of the cultural heritage monument and their visual nature is useful for the public dissemination of the involved danger. According to our records, this is the only detailed erosion simulator for stone. This work is supported by the European Unions Seventh Framework Programme (FP7/2007-2013) under grant agreement no 600533 PRESIOUS (www.presious.eu). I. BarrosBarbosa, Gebremariam, K. F., Perakis, P., Schellewald, C., and Theoharis, T., “Establishing Parameter Values for the Stone Erosion Process”, 43rd Annual Conference on Computer Applications and Quantitative Methods in Archaeology (CAA 2015). 2015. The computer simulation of the naturally occurring stone erosion process is very attractive because it could enable us to predict the future state of important cultural heritage monuments based on different environment scenarios and thus allow us to take appropriate action in good time. This paper describes the design and construction of two automatic erosion chambers that allows to simulate the Salt and Freeze-and-Thaw effects respectively on a low budget, based on a control system using off-the-shelf components. 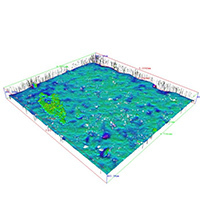 It also details the parameters that are being measured after each erosion cycle (3D scan, electron microscopy, micro computed tomography, 3D microscopy, XRD and petrography) which will eventually lead to a publicly available database for erosion benchmarking. In the current phase we are only concentrating on Pentelic marble and two types of Grytdal soapstone. This work forms part of the PRESIOUS EU project (www.presious.eu). D. Biella, Pilz, T., Sacher, D., Weyers, B., Luther, W., Baloian, N., and Schreck, T., “Crowdsourcing and Co-curation in Virtual Museums: A Practice-driven Approach”, Journal of Universal Computer Science, vol. 22, pp. 1277–1297, 2016. This paper gives an overview on crowdsourcing and co-curation practices in virtual museums. Engaged nonprofessionals and specialists support curators in creating digital 2D or 3D exhibits, exhibitions and tour planning and in the enhancement of metadata using the Virtual Museum and Cultural Object Exchange Format (ViMCOX). ViMCOX is based on international Lightweight Information Describing Objects (LIDO) v1.0 metadata standard, provides the semantic structure of exhibitions and complete museums and includes new features, such as room and outdoor design, interactions with artwork, path planning and dissemination. Various application examples show the impact of crowdsourcing, co-creation and co-curation on the digitalization of expositions in classical museums and on the creation of virtual museums. The case studies are devoted to restoring lost or damaged artwork by the German-Jewish sculptor Leopold Fleischhacker, high-quality 3D shapes and Armenian cross stones. Finally, the paper reports on an evaluation in the field of usability, user interfaces and the crowd's willingness to undertake various co-curation subtasks. 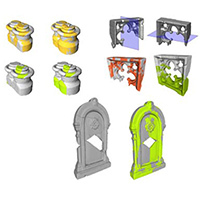 R. Gregor, Mavridis, P., Wiltsche, A., and Schreck, T., “A Soft Union based Method for Virtual Restoration and 3D Printing of Cultural Heritage Objects”, Eurographics Workshop on Graphics and Cultural Heritage. 2016. Recent improvements in 3D acquisition and shape processing methods lead to increased digitization of 3D Cultural Heritage (CH) objects. Beyond the mere digital archival of CH artifacts, there is an emerging research area dedicated to digital restoration of 3D Cultural Heritage artifacts. In particular several methods have been published recently that, from a digitized set of fragments, enable their reassembly or even the synthesis of missing or eroded parts. Usually the result of such methods is a set of aligned but disconnected parts. However, it is often desirable to produce a single, watertight mesh that can be easily 3D printed. We propose a method based on a volumetric soft union operation that can be used to combine such sets of aligned fragments to a single manifold mesh while producing smooth and plausible geometry at the seams. We assess its visual quality and efficiency in comparison to an adaption of the well-known Poisson Reconstruction method. Finally, we provide practical insights on printing the results produced by our method on digitized fragments of real CH objects. A. Andreadis, Papaioannou, G., and Mavridis, P., “GPU Accelerated Computation of Geometric Descriptors in Parametric Space”, in Computer Vision, Imaging and Computer Graphics Theory and Applications, vol. CCIS 598, 2016, pp. 41-61. We present a novel generic method for the fast and accurate computation of geometric descriptors. While most existing approaches perform the computations directly on the geometric representation of the model, our method operates in parametric space, decoupling the computational complexity from the underlying mesh geometry. In contrast to other parametric space approaches, our method is not restricted to specic descriptors or parameterisations of the surface. By using the parametric space representation of the mesh geometry, we can trivially exploit massive parallel GPU architectures and achieve interactive computation times, while maintaining high accuracy. This renders the method suitable for computations involving large areas of support and animated shapes. Author-prepared version of the chapter. M. A. Savelonas, Pratikakis, I., and Sfikas, K., “Fisher Encoding of Differential Fast Point Feature Histograms for Partial 3D Object Retrieval”, Pattern Recognition, p. -, 2016. 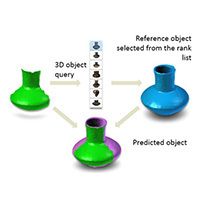 Abstract Partial 3D object retrieval has attracted intense research efforts due to its potential for a wide range of applications, such as 3D object repair and predictive digitization. This work introduces a partial 3D object retrieval method, applicable on both point clouds and structured 3D models, which is based on a shape matching scheme combining local shape descriptors with their Fisher encodings. Experiments on the SHREC 2013 large-scale benchmark dataset for partial object retrieval, as well as on the publicly available Hampson pottery dataset, demonstrate that the proposed method outperforms seven recently evaluated partial retrieval methods. K. Fanta Gebremariam, Perakis, P., Schellewald, C., Theoharis, T., and Kvittingen, L., “Multi-technique Characterizations of Marble Stones from Elefsis, Greece, and Soapstones from Grytdal, Norway in Accelerated Acid Weathering Studies”, in 18th European Conference on Analytical Chemistry (Euroanalysis 2015) - Poster presentation, 2015. 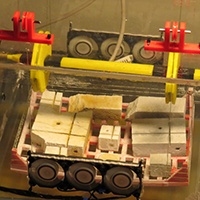 Studies on the effects of acid pollution were conducted on three types of stone samples: marble stone from Elefsis, Greece, and two types of soapstone from Grytdal, Norway. 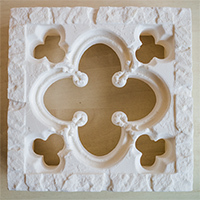 The Pentelikon marble stone from Elefsis used in columns at the archeological site in Elefsis where as the Grytdal soapstones for the construction of Nidaros Cathedral Church in Trondheim. The investigation is part of a larger project in which we attempt to estimate and predict stone erosion from weathering, in order to reconstruct earlier appearances and predict future transformations. The approach involves studies of accelerated weathering effects from salt, acid and freeze-thaw on stone samples, site exposure tests and successive high accuracy surface scanning of the monuments in which the stones have been used. For the simulation of the accelerated acid weathering two acidic conditions (nitric and sulphuric acids) at constant pH’s were selected. Loss in mass with time and the physicochemical changes on macroscopic and microscopic levels were monitored, including qualitative and quantitative estimates of the acid rain-induced surface recession. The stones were analyzed before and after exposure to the acidic conditions with a range of analytical techniques. 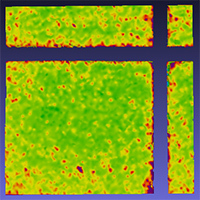 The acidic solutions used in the acid weathering simulation were evaporated to dryness and the residue investigated to identify salts produced in order to shed additional light on the deterioration processes.